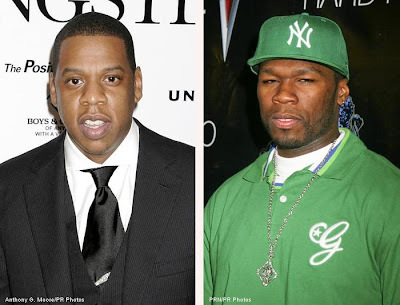 Did you know 50 Cent has an album supposedly dropping the same day as Jay Z? Personally, I can’t remember a 50 Cent project coming out that had no controversy attached to it! But, then again Jay Z effectively stole his thunder. Let’s just say he out “Fiftied” Fifty. With “D.O.A.”, Jay Z basically did what 50 Cent has always done to fuel interest in his projects, throw out diss records and challenges to whoever is holding on to the top spot at the time. Remember before “Get Rich or Die Trying” it was an all out attack on the original “Radio Killa” Ja Rule. Then on “The Massacre” Fifty upped the ante by not just finishing off Ja Rule, but also dissing Fat Joe, Jadakiss and Nas just for kicks. I remember the incredible buzz around the song “Piggy Bank”, not that it was that great of a track, but it was the brashness of Fifty to take on MCs that were perceived to be better lyricists. And just for good measure he publicly dismissed the Game from G-Unit, which lead to a shooting outside Hot 97. Needless to say, all everyone was talking about was Fifty and he proceeded to sell over 1 Milli in a week.